Finally, I am back from a Royal vacation from Royal Rajasthan. Indeed, Rajasthan is a place of Rajas and Rajwadas, completely representing glory of India. I must say, I am totally mesmerized with Rajasthan and the Royal treat there. The slogans of Rajasthan Padharo Mhare Desh and the lok geet of Rajasthan Keshariya Balam Padharo Mhare Desh is worth following and you won’t repent going there. Before planning the journey to Rajasthan, I had a slight insight of my childhood visit to Rangilo Rajasthan with lots of colors, elephants, camel, colorful dresses, which all stood true in my second visit too. I just enjoyed, enjoyed and enjoyed. My journey began with Jaipur. Jaipur city is the capital of Rajasthan. How to reach Jaipur City, Rajasthan? It has very easy reach ability through flights or trains. We reached there by train. Sleeping at night in train and reaching there by morning is very comfort tour from Surat. We booked a very nice property there, Arya Niwas. It will give you a good experience of staying in a Haveli with three star facilities. The interiors of the property resembles the tradition of Rajasthan. Foreigners prefer to stay here. There are two more properties around Arya Nivas, which are equally lavish. It is located in old city and very near to all the historic places. Perhaps, it is some old Haveli converted to Hotel. Hotel bookings in Jaipur is really easy online. You can find budget to luxury hotels here. We reached a bit late there. All historical places in Rajasthan gets closed by 5 PM, so we planned to visit Birla temple. It is a temple built by Birlas. There is an old fort, which is opened just once in a year. We asked security people that what is there in the fort. They said nothing is there, only snakes and bats. This place is also known as Ganesh Dungri. It is believed that Ganesh Mandir here is a wish fulfilling temple. You get what you wish here. Ganesh Mandir is just beneath that old fort. Then with no option left, we proceeded to the local markets. Jaipur is also known as Pink City of India. You can find all buildings in Pink color with historic carvings and details. Everywhere there is Nakashi on attractive building structures. There are three parallel markets with same structure. You won’t be able to differentiate if you are unknown to it. We went to Zaveri Bazar. You can visit only one market in a day as they are so many shops and huge area covered for one Market. It is a shoppers heaven. You can go for shopping spree specially to Jaipur city. 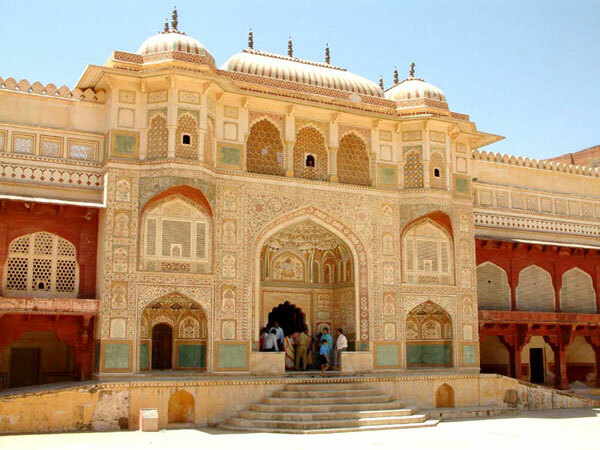 Amber fort in Jaipur City – one of the most interesting places to visit in Jaipur City. The next day was planned as visit to Amer fort. The fort here is named as Amber fort. Jaipur city was historically located here in Amer. If you have watched movie Jodha Akbar, then Jodha was princess from Amer. There are three forts to be visited here. Amer fort, Nahar Garh and Jaigarh. Jai Garh fort was built by Maharaja Jai Singh. Amber fort was built by Maan Singh. He had 12 queens. It is very interesting to know the living styles of Rajwadas. Truly Royal, I would say. During those days, they were having swimming pools for their queens with scented water, fountains and rich galleries, and gardens for relaxations. I was always curious to know about there bathrooms of royals. My curiosity was finally satisfied here. Queens had separate swimming pool like bathrooms with special changing and dressing rooms. Special wash areas, where there maids cleaned and washed there lavish dresses and separate sections for drying there clothes. Interesting, isn’t it? For all his 12 queens, there were 12 different apartments with three rooms. One more thing interesting about Rajasthan is, though they are not geographically located near sea or having some prominent river and is a desert land, but the Kings at those time were real far time thinkers. They had huge lakes built in a strategic and technical ways to conserve rain waters and even in today’s time, these lakes are source of water for the people living there. Municipal corporations are supplying water to people through these lakes only. Amber fort is also surrounded by lakes of which one is Maota lake with scenic lake gardens. As soon as you enter the amer fort, you will be welcomed by Jalebi chowk. On the rightmost side, you should visit Shila devi temple. Though, it is being said that practice of offering bali, sacrifice of an animal is stopped here, we were informed by the guide that daily sacrifice of a goat is given to Shila devi. It is said that world’s largest tunnel is inside this temple, which is now not allowed for people and closed. We saw a half opened but chained door in the temple, which on asking, security person said that it is that tunnel. It is a lokvayka (discussed among people) that earlier bali was given of a man, which was later on converted to goats or sheep and the very first bali that was given was of a kid. No proof of truth is available. 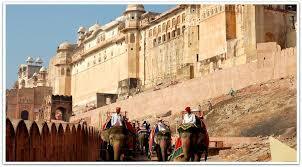 You can enjoy elephant ride in this fort visit. After this place, you won’t find elephant ride anywhere in Rajasthan. Here, elephant will take you one way to Jaleb Chowk. You can reach here by car through interiors of the fort city, but if you wish to go by elephant then it will be a good life time memory. There is one external area where you will find ancient architecture and water body. Under the steps of this water body, there is a way to 12 rooms underground, which is said to be the place from where Maharaja Jai Singh found huge amount of wealth in form of gold, silver, precious stones and many more (khazana), which were used to habitat Jaipur city. There is a Government authorized shop here at the entrance for display art of Rajasthan. You can purchase specialties of Jaipur from here. The Mojdi made from camel leather is a must buy. I assured whether camel is not killed to make this Mojdi. They assured me that when a camel is dead, his dead body is submitted to the government of Rajasthan. They extract leather to manufacture this Mojdi. The quality and softness of Mojdi is simply superb and you won’t find same quality anywhere in Rajasthan, after this. You would love to know more about the places to visit in Sikkim from my previous travel experience. The major attraction for Jai Garh fort is the world’s largest canon with intricate carvings, which is laid on wheels. You will find combination art of war lovers and art lovers in this particular making of canon. This canon was supposed to be loaded by a huge gun powder ball of 50 kg which you can see in the museum. Only two such gun powder balls of 50 kg were manufactured so far, of which one was used for testing and the other found the place in the museum. Because of this canon and other strong weapons, enemies never won over the kings of Jaipur. Jaigarh fort is an attraction in Jaipur. If you are thinking that this is some palace then you are wrong. It is just a structure of exterior of a palace. 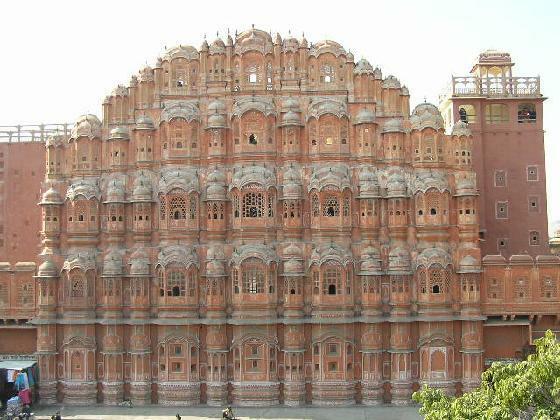 May be it was named Hawa Mahal rightly that palace like structure having windows through which Hawa (air) can pass. One of the most recognized places of Jaipur attractions. Grandeur in its best. Peacock gate and other artifacts belongings of the royals will make you think on the lavish life they used to spend. Don’t forget to have experience of Pani puri in Jaipur. They call it as Pani Patasha. Every now and then, we enjoyed having Pani Puri here. It was fun. Pani Puri here is different from what we prepare and get in our city Surat. Then it was difficult to spot Pani Puri anywhere in Rajasthan. Food of Arya Nivas is highly appreciated among foreigners and Indians, so we spend a candle light dinner at Arya Nivas garden. It was just lovely. There are two more restaurants located in shopping market, which are favorite of foreign tourist. I just loved the flavor of Mughlai chicken, they offered. Coming up with few more posts from Royal Rajasthan to give my royal experience, the expression of words. Why Do You Need to Travel to India?